You can get my sparkenations direct to your in-box here. 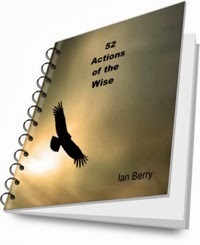 As a reward for subscribing you will be able to download my ebook 52 Actions of the Wise, a resource 1000s of people have used as a 1 year personal and business development program. One of the reasons I am a proud partner of Buy One Give One is that 100% of what I give goes to the causes and people that I support. A second reason is the power of small. B1G1 is really about the little things that make the big difference beautifully tied in with the everyday transactions and interactions of business. A third reason is that many causes B1G1 supports are about helping people to take care of themselves so that eventually they don’t need help from others. As you shop in the coming days think not just about what you’re giving and getting, think and do something about helping others to help themselves. And think too about the greatest gift of all that you can give to the world, your best self.